This chapter situates the género chico criollo as the preeminent form of entertainment in Buenos Aires during the period of Argentina’s modernization. I argue that popular theater was crucial for mediating the public and private, relating the everyday lives of the characters to broader socio-economic and political trends in liberal modernity. Moreover, the plays provided audiences with the language and actions necessary to symbolically renegotiate their place in the nation. 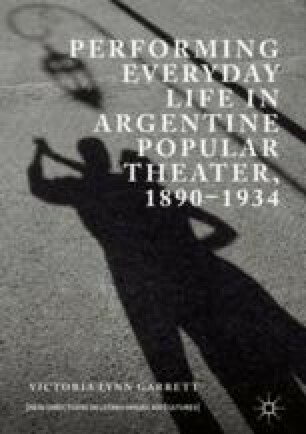 This chapter engages studies of Argentine popular culture and criollismo, current theorizations of everyday life as a central space for subverting power, and scholarship on how theatricality undermines the “naturalness” of dominant cultural scripts. Through the performance of diverse stories of everyday life, the plays created a critical space for the development of cultural agency in which new cultural scripts were evaluated.